Marbled Olive Oil Cake aka Tiger Cake is made with extra virgin olive oil and a dash of white (or black) pepper. For best results, use a very robust and flavorful olive oil. Preheat the oven to 350 degrees F. Grease a 6 cup capacity loaf pan and line lengthwise with a 12x3 inch strip of parchment. Dust with flour. In a 2 cup measuring cup or in a bowl, whisk the cocoa, sugar, and water until well blended. In large bowl, whisk the flour and baking powder thoroughly and sift onto a piece of wax paper. In a the bowl of a stand mixer fitted with the whisk attachment, beat the sugar, oil, vanilla, salt, and pepper (if using black pepper, don’t add it yet) until well blended. Add the eggs one at a time, beating well after each addition. Continue to beat until the mixture is thick and pale, 3 to 5 minutes. Stop the mixer and add the flour and milk alternately beating on low speed or by hand just until blended. Add 1 1/2 cups of the white batter to the cocoa mixture and stir until blended. If using black pepper, go ahead and add it to the cocoa batter. Pour some of the plain batter into the center of the loaf pan and let it flow out a bit. 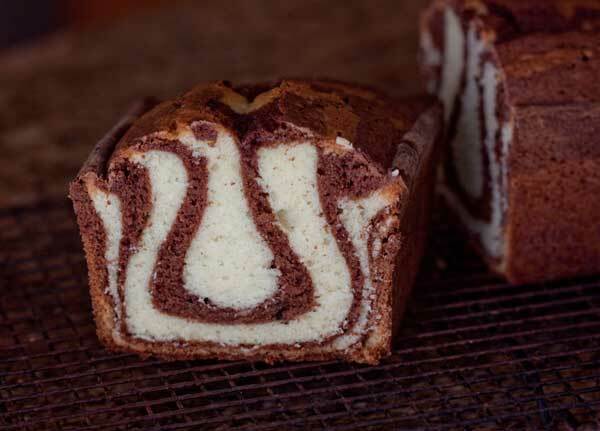 Pour some of the cocoa batter into the center of the white batter and let it flow out into a bullseye pattern. Continue adding the batters alternately this way without stirring. Alternatively, just pour the batter into the pan alternately however you want. Bake 1 hour to 1 hour and 10 minutes, until a toothpick inserted into the middle of the cake comes out clean. Set the pan on a rack to cool. Allow the cake to cool for about 20 minutes in the pan, then remove from the pan and let cool completely. The cake keeps for several days, at room temperature, under a dome or wrapped in plastic. I cut mine in half and froze the two halves (after taking a few slices for the family).